HEY GUYS! LOOK! It’s a free sample for my awesome Blank Board Games. So what is a Blank Board Game? Here’s my theory on things. You don’t need a completely new product every time you teach a new unit. What you need is something flexible, something you can tailor to your specific and current learning outcomes. 1. Well, obviously they come with a game board – two letter-sized images you print, trim, and attach to the inside of a file folder. Most games will come with a variation of game board colors, which will be indicated on the preview. 2. Multiple variations of printable cards for game play: some are completely blank, some have characters or images relating to the board, and some have game directions like “lose a turn.” There are also variations of border colors for cards, so you can easily differentiate sets if you create multiple games or levels for a game. 3. A printable front cover for your file folder if you want to label them like this – this is also great for leaving the top open and keeping an envelope of cards inside. 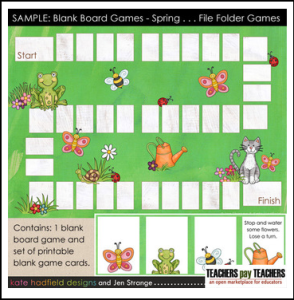 To view all the Blank Board Games in my store, please click here. click it to become a follower.